Venezuela’s Bolivarian Revolution hasn’t established socialism. But it has brought the poor into public life. Geographically, Caracas, Venezuela consists of a relatively short, narrow valley just over twenty miles in length, sheltered from the Caribbean Sea by a mountain range to the north, with population seams radiating southward in a series of smaller valleys. The old city center lies to the west of the valley, with growth historically moving ever eastward: first in verdant suburbs, then elite urbanizations, and finally — the valley’s easternmost limitations reached — the massive informal barrio settlements that precariously ring the hilltops of nearly the entire city. Standing in Altamira Plaza — the center of Caracas’ private wealth and informal capital of the political opposition — wealthy, white elites cannot help but feel surrounded: Petare — arguably Latin America’s largest and most dangerous slum — to the east, the city center and Catia to the west, and innumerable smaller barrios sprawling southward. What to call these people who became a majority over the past few decades? Marginals. This term certainly reflects the geographical segregation of the city: barrio residents were largely confined to the outskirts, to unstable terrain in the hills where they first erected cardboard, then tin, and finally cement homes as their informal settlements became permanent. But the concept of marginality was itself more about fear than description, never successfully accounting for the centrality of shantytown residents in the circulatory system of the capital. Calling the urban poor “marginal” was a mantra that sought to exorcise a threat, but it failed spectacularly. And by obscuring the poor, it only intensified the inevitable shock. The 1980s were a time of acute economic crisis in Latin America. The debt crisis coincided with a sharp decline in oil prices, convulsing the Venezuelan economy and resulting in a massive devaluation of the bolivar. Amid this perfect storm of crisis, revolutionary movements long isolated from a social base capitalized on discontent in the barrios to press an unresponsive and corrupt political system, and the Venezuelan state — unable and unwilling to provide for the poorest — confronted rebelliousness with massacre. No rebellion was more momentous and no massacre more severe than 1989’s Caracazo, arguably the world’s first major anti-neoliberal rebellion. For nearly a week, the urban poor of the barrios protested, rioted, and looted in response to the government’s imposition of an austerity package on the World Bank model. The rancid leadership of a flailing, two-party system only enforced a relative calm by slaughtering hundreds — arguably thousands — in the barrios they’d ignored for so long. The shock that the Caracazo represented for Venezuela’s wealthy, white elites cannot be overstated, and this shock was above all geographical. Never before had their space been penetrated so suddenly and systematically by the economically and racially different others. Many still speak of the rebellion as the day when “the blacks came down from the hills” or, even more dehumanizingly, as when “the hills came down” — the massacre of the non-human invaders considered a necessity, however tragic. The Caracazo marked not only the death of the old but the violent birth of the new, setting into motion a dialectic of movements and military conspiracy that would eventually see Hugo Chávez tossed into the seat of power. In the short term, however, the shock and fear the Caracazo inspired in elites resulted in both “progressive” urban reforms and the seemingly contradictory — but in reality complementary — militarized segregation of urban space. One such reform was the Organic Law for Municipal Government, conceived prior to but approved only three months after the Caracazo, and which facilitated a decentralization of the city that some have termed neoliberal urbanism. Within two years, new municipalities in the wealthiest part of the capital had effectively seceded, claiming autonomy from city government, electing their own mayors, and, crucially, establishing their own police forces. Already wealthier than much of the urban area, these new municipalities — and the sheltered central business district of Chacao above all others — used their newfound administrative autonomy to draw even more revenue away from the traditional city center. Deploying their newfound policing powers to ethnically cleanse neighborhoods of marginal populations and street vendors, these municipalities trumpeted their safety in contrast to other, less fortified areas. Alongside this neoliberal decentralization, the echoes of the Caracazo played out in a multitude of small-scale transformations that gave an architectural form to elite fears. Electric fences, barbed wire, fortress architecture, gated communities, and even residential checkpoints quickly became the norm. where they live, God willing. . .
And like Algeria, the border between rich and poor, white and dark-skinned, was established by force, patrolled by local police and private armed guards. To this day, nothing elicits so panicked a response as a poor motorcyclist, or motorizado, capable of quickly and unpredictably crossing the bounds of this informally segregated landscape. History only bends so far toward the powerful, however, before swinging back with a vengeance, and the destruction of the old political system would inaugurate new efforts to break down the walls of urban segregation. Hugo Chávez’s violent intervention into the political life of the nation in a failed 1992 coup was the precondition for his 1998 election to the presidency. While Chávez was initially elected with significant middle-class support on a platform that shunned overt mention of race and class, his dynamic relationship with social movements — and aggression from the right — dramatically radicalized the Bolivarian process. Here too, struggles would play out on the terrain of urban geography. The early stages of the process focused on more moderate social welfare, but in the combative whirlwind leading to the brief coup against Chávez and the constitution in April 2002, the government first passed the Land Law, which expropriated idle land in the countryside, and then Decree 1,666, which facilitated similar claims in the cities while legally enshrining Urban Land Committees (UTCs). 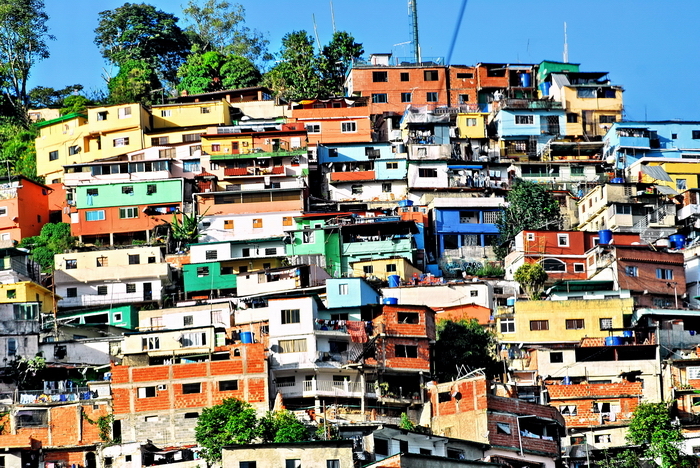 In the years since, the government has sought to compensate for the lack of urban housing stock, especially in Caracas, with ambitious programs like the Housing Mission (Misión Vivienda). Under that program, more than six hundred thousand low-income housing units have been built since 2011, with a goal of more than two million by 2018. While these towering red-and-white apartment blocks are often built in less desirable locations, they are increasingly appearing in the wealthier central zones of Caracas as well, occasionally prompting protests from residents. It was popular mobilization that forced the creation of the UTCs, another instance — alongside communal councils, water committees, and many others — of popular participation. Once established, these UTCs provided even more space for grassroots movements to occupy and leverage for popular ends. More daring still is the Squatters’ Movement (Movimiento de Pobladores), which joins the UTCs with tenants’ networks, building custodians and caretakers, and “pioneer camps” and engages in land occupations similar to those of Brazil’s Landless and Homeless Workers’ Movements. They squat on urban land, demanding that titles be granted to construct self-managed housing. Such controversial tactics — predictably deemed “invasions” by their opponents — actively push the envelope of mainstream Chavismo, with many leaders considering them unnecessarily provocative, even anarchic. But in their war against what they call “urban latifundistas,” a reference to the large landholders often associated with rural areas, the Pobladores managed to enlist a powerful ally: Chávez himself, who eventually endorsed the movement and the right to occupy vacant urban land. The return of the poor to the heart of the metropolis has raised the specter of rebellion by a dark-skinned “other,” provoking elite panic and reaction. It was no coincidence that opposition marchers regularly invaded Misión Vivienda installations in the run-up to the April 2013 presidential election, just as it was no coincidence when, during the recent wave of opposition youth demonstrations, protesters attacked and burned the program’s headquarters. Nor is it any coincidence that the abandoned skyscraper-turned informal housing settlement known as the Tower of David — demonized in the New Yorker by Jon Lee Anderson — has become a veritable lightning rod for elite anxiety. Elites clearly understand that “dignified housing” means “them” returning to the heart of the city from which they’d been systematically cleansed. “City of Goodbyes” was roundly mocked by Chavistas and provided fodder for dozens of derisive memes. Here was the terminal decadence of a class facing competition from the upwardly mobile poor, no longer enjoying privileged access to lucrative government jobs, and forced to rely on the stunted private sector, itself clinging parasitically to the bloated sanguinity of the state. Were this merely the terminal decadence of a displaced elite, we could simply welcome their departure and be done with it (after all, more people move to Venezuela for the opportunities it holds than abandon it for abroad). But as it turns out, this repressed desire to escape returned with a vengeance in the middle-class protests earlier this year. If recent years have marked not the establishment of a socialist country but the appearance of the poor in the public life of the nation, then it is clear that some nostalgically wish that they would once again disappear, retreat into the shadows, or be compelled to withdraw. Consequently, it was no surprise that rather than breaking down the barriers of urban segregation, rather than abandoning their wealthy militarized refuges in an authentic attempt to connect with Venezuela’s majority, the protesters instead upheld in their action the very division of the landscape that has come to mark the neoliberal era. George Ciccariello-Maher is the author of We Created Chávez: A People’s History of the Venezuelan Revolution (Duke, 2013); Building the Commune: Radical Democracy in Venezuela (Jacobin-Verso: 2016); and Decolonizing Dialectics (Duke, 2017).